Euro 2012 Group D reaches a dramatic conclusion this evening, with England set to recall Manchester United striker Wayne Rooney for their crunch clash with co-hosts Ukraine. The Three Lions will book their place in the quarter-finals if they avoid defeat in Donetsk and will top the group if they better France’s result against Sweden. Roy Hodgson’s men go into this game on the back of their impressive 3-2 victory over Sweden in Kiev on Thursday. Although strikers Andy Carroll and Danny Welbeck scored either side of a Theo Walcott 20-yarder, Hodgson has already confirmed that Rooney will start as he returns from a two-match suspension. The 26-year-old is 9/2 to get the first goal on Tuesday or 3/2 to score at any time and both prices are sure to receive plenty of interest. A double here would take England’s number ten to 30 international goals, which would make him the national team’s joint-fifth top scorer of all time, along with Tom Finney, Nat Lofthouse and Alan Shearer. 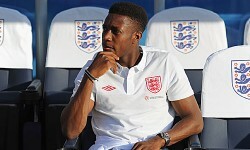 Check out all our Ukraine v England goalscorer markets! However, there could more value in the 6/1 offered for Rooney to score at least twice, as he famously did when bursting on to the international scene as a teenager with a stunning brace against Croatia at Euro 2004. Another double here would take England’s number ten to 30 international goals, which would make him the national team’s joint-fifth top scorer of all time, along with Tom Finney, Nat Lofthouse and Alan Shearer. Punters who use their free £20 bet – which is available to anyone registering with bwin – will see a return of £140 if they correctly back Rooney to bag at least a brace. And considering the impressive partnership Rooney has forged with United strike partner Danny Welbeck – who is likely to get the nod over Andy Carroll – backing the youngster to follow up his goal against Sweden by notching again this evening could be worth a go at 2/1. Another Red Devil, Ashley Young, looks like a decent outside punt when looking at potential Three Lions goalscorers. He scored two goals in the three games leading up to Euro 2012, so you may be tempted to back him at 9/4 to score at any time and break his tournament duck. Meanwhile, three points will see co-hosts Ukraine through to the last eight of the competition, though the odds are stacked firmly against them. Talisman Andriy Shevchenko, who is expected to shake off a troublesome knee injury to take his place in the Oleh Blokhin’s starting XI, has scored more than half of Ukraine’s all-time tournament goals. The Dynamo Kiev striker is 2/1 to score at any time on Tuesday and 7/1 to give his side the lead – and both prices look reasonable considering the defensive frailties England showed in their victory over Sweden.